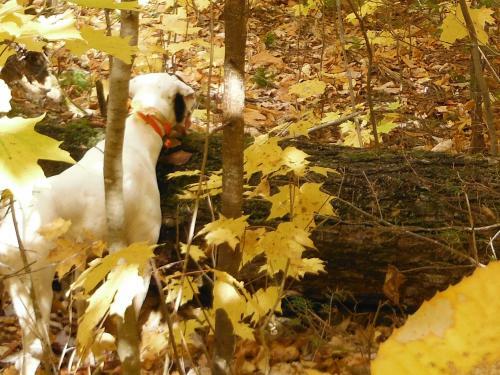 One aspect of October at Maine Outdoors is guiding grouse and woodcock hunters at Libby Camps in the North Maine Woods. It is great fun to work with the dogs, see the leaves change and spend time in the remote woods. Finding the birds is the dogs job and I keep the hunters in position and safe. Over the years I have seen many birds on the ground in front of the dogs on point but struggled to get a picture. This is my best one yet and hopefully you can see the woodcock on the ground in front of Blue my English Pointer. The point over the log makes it that much more interesting. This season is very busy and seems like it is over in a flash. With any luck I’ll get another good picture.